The Ballast Water Management System (BWMS) Convention entered into force on 8 September 2017. A key international measure for environmental protection that aims to stop the spread of potentially invasive aquatic species in ships’ ballast water enters into force today (8 September 2017). The International Convention for the Control and Management of Ships' Ballast Water and Sediments (BWM Convention) requires ships to manage their ballast water to remove, render harmless, or avoid the uptake or discharge of aquatic organisms and pathogens within ballast water and sediments. Under the Convention, all ships in international traffic are required to manage their ballast water and sediments to a certain standard, according to a ship-specific ballast water management plan. All ships have to carry a ballast water record book and an international ballast water management certificate. The ballast water management standards are being phased in over a period of time. New ships must meet the ballast water treatment standard. Existing ships should exchange ballast water mid-ocean but they will need to meet the ballast water treatment standard by the date of a specified renewal survey. Eventually, most ships will need to install an on-board ballast water treatment system. Being a relatively more mature disinfection technology, compared to other disinfection technologies, ultraviolet disinfection does not produce active substances, does not pose an occupational hazard to crew, more economical and environmentally friendly. 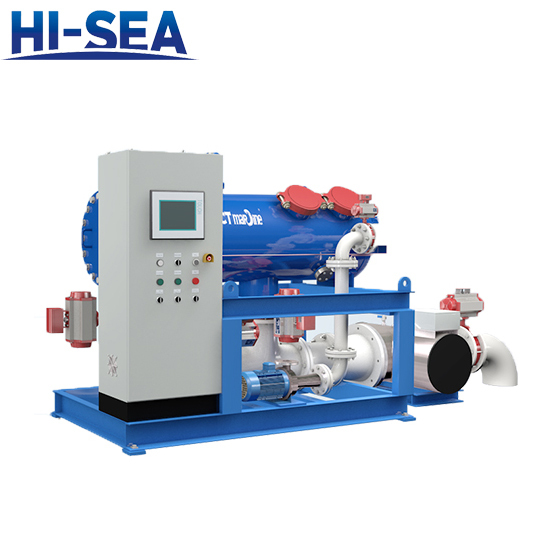 Hi-sea unique UV design philosophy enables the following: under Economy Mode, the BWMS adjusts the UV intensity according to incoming water quality; while under Performance Model, the BWMS utilizes an increased UV intensity at a user prescribed setting. Hi-sea MPUV Reactor in Economy Mode, compared to ordiary UV reactors, is lower in OPEX; while in Performance Mode, it is able to meet more stringent discharge requirements due to its considerable design allowance, without need for further system upgrade or modification, enabling flexible operation in different legislative regimes worldwide. (4) Chemical-free operation, safe for crew and vessel.